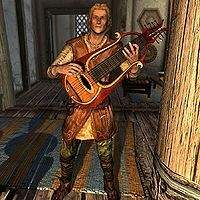 Mikael is a Nord bard performing at the Bannered Mare, and the author of A Gentleman's Guide to Whiterun. He believes himself to be quite enthralling to women and will remark: "Once Mikael gets them, they're got." He spends all his time at the inn, alternating between playing his instruments and chatting to any women present, whether they are single or married. His parting advice is that, "Women love sonnets." If your character is female, upon leaving a conversation he'll say, "It's the leaving that's hardest, I know." When asked where he learned his trade, he explains that he studied at the Bards College, but had to leave due to a 'misunderstanding' with a headmistress and her husband. He wears a set of farm clothes and boots. He carries an iron dagger along with a selection of common items and gold. Depending on your dialogue choices during A Few Words with You, you may hear Mikael refer to Carlotta Valentia as a "Nord lass", though she is in fact an Imperial. Jon Battle-Born will sometimes say "But Mikael... He sings only for gold and the affections of wenches. He dishonors our traditions.". However, Mikael plays songs for free, regardless of gender. A Gentleman's Guide to Whiterun states that he is an Imperial and that Adrianne Avenicci is a Nord, which is the wrong way around. This issue has been addressed by version 1.2.4 of the Unofficial Skyrim Patch; it has modified the text to reflect that Mikael is not actually an Imperial, along with other changes. He goes to the wrong kitchen wing upstairs bed, as he doesn't own that bed. This page was last modified on 2 April 2019, at 15:02.